The Master of Management creates business leaders who are ready to take on challenging roles within contemporary organisations across a range of industry sectors. Managers increasingly require a broad set of advanced theoretical knowledge and applied techniques in order to be able to lead organisations through periods of complexity, uncertainty and change. The Master of Management is designed to provide highly developed business knowledge and skills that are the basis of responsible leadership, ethical decision-making and the effective management of organisations operating in the private, not-for-profit and public sectors. This course will not only prepare you for a leadership role; it will teach you how to work effectively, apply contemporary management practices and demonstrate key management skills and attributes. The Master of Management is structured to provide you with the perfect balance of theoretical coursework and practical experience. 3 semesters (12 subjects) of in-depth coursework studies plus a Work Integrated Industry Research Project, where you will undertake work integrated learning for 600 hours and apply your knowledge to real business issues. Delivery through a combination of small lectures, tutorials, workshops and industry research to cater for a range of learning styles. The two-year course duration means international students are eligible for a two-year post-study work visa. possess an advanced understanding of key management concepts and skills underpinning business operations. critique a range of contemporary social, economic, political, and cultural factors facing organisations in the new economy. communicate effectively with a diverse range of stakeholders. synthesise and articulate information in order to generate evidence-based and sustainable solutions for business problems. possess an integrated understanding of ethics, social responsibility and cultural awareness in business and management. generate soundly researched, evidence-based and create solutions for business problems. apply theoretical knowledge and advanced professional skills generated through research, reflective practice and observations in a work context. reflect on and evaluate personal management and leadership styles. Graduates of the Master of Management will benefit from a variety of enhanced career opportunities. Graduates will find employment in a range of organisational settings in the public, private and third sectors. Roles may include general management, business strategy and policy, corporate governance, quality assurance, finance, planning, business analyst, operations and logistics, human resource management, sales, marketing and consulting. Read the course information carefully. Ensure the qualification aligns with your interests and career goals. Check the entry requirements. These will be different for domestic and international students. Complete the online application form directly or through one of international representatives, or via UAC (domestic students only). 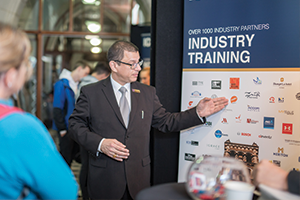 Visit our campus and speak to a Student Advisor who will be able to tell you more about our highly regarded industry training program.